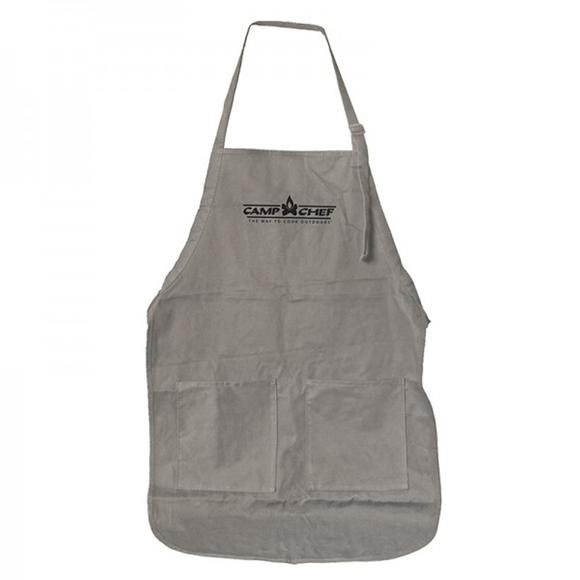 Keep yourself clean with Camp Chef's Grey Apron. The durable thick cotton has been treated with a water resistant agent and has two large front pockets making it great for all types of cooking. A knee length design and long waist ties assure fitting for most body types. Keep yourself clean with Camp Chef&apos;s Grey Apron. The durable thick cotton has been treated with a water resistant agent and has two large front pockets making it great for all types of cooking. A knee length design and long waist ties assure fitting for most body types.